This issue's article is an interview with Vera Stevens whose simple and highly effective methods of teaching maths to the youngest students (or those of any age with learning difficulties) is rapidly becoming appreciated around the world. Vera has recently returned to Australia after travelling in the UK and the Czech Republic. Without exception, her work was accepted with enthusiasm by teachers, parents and pupils. She introduced her mathematics to two schools in south-west Scotland, the St James schools in Stockport and London and also the Kings Langley Rudolph Steiner School. She spent three days in Stockport, working with all the classes as well as a few individual students. At the Steiner school, Vera spent time, about 20 minutes, with a student who had no understanding whatsoever about numbers. This child left the session with a smile and a new confidence that she could now approach arithmetic. Perhaps you have your own anecdote - if so please send it to us for inclusion! The latest teacher training course, run in association with e-gurukul.net, has recently ended and was huge success. Another batch of teachers are now fully trained and certified and many are introducing the Vedic system in their area. The next course is scheduled for the beginning of September 2012 and you will hear through this newsletter when and how to apply if you are interested in joining. An article by Dr D.K.R. Babajee titled "A Method for Finding the Square of any Number" is now in our online Journal. This shows an unexpected extension of the method for squaring a number near a base which leads to a general method of squaring numbers. Also, an article by Vitthal Jadhav is published titled "Recursion based Derivation of Duplex Square Method". This proves the Vedic duplex method of squaring numbers. method and show that it can be obtained from the fact that the excess of a right-angled triangle is even. 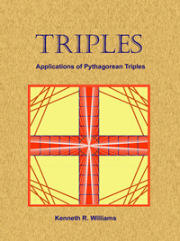 Using this property, we develop several formulae for generating Primitive Pythagorean Triples. I was invited by my friend to attend his daughter's marriage at Madurai, a temple city, down south of Tamil Nadu and about 400 km from Chennai where I live. The marriage was on the next day and suddenly it struck me why I should not use this opportunity for an awareness session on VM in some schools nearby when the function will be over by 10 am. When I approached the Senior Manager of UCO Bank, Madurai Branch, he was willing and swiftly contacted a Higher Secondary School near the Bank Branch run by State Government and the medium of instruction is in Tamil. The Headmistress was kind enough to accord permission immediately and the session was scheduled for 60 minutes from 11.30.to 12.30 ie before lunch recess. The teachers were so enthusiastic and eager to know about the Vedic Methods arranged for the session. The gathering comprised around 60 students from 10th Std, 9th Std and 7th Std and five teachers. Being a short session I straight away started with number system, compliments of ten, subtraction using Nikhilam method, digit sum and its uses to verify the results, multiplication of numbers near the base and squaring of numbers ending with 5. The students were impressed and requested to explain the methods with the numbers suggested by them. The session which was scheduled for 60 minutes extended up to 90 minutes ie beyond the lunch recess. After the session was over the teachers requested me whether I could continue the sessions on daily basis. When I told them that I am stationed in Chennai, they requested me to come to their school whenever I visit Madurai and teach the students the VM as these students are from lower Income group and who cannot afford private tuition or outside classes. What started your interest in teaching maths? My interest in teaching maths came, primarily from seeing my daughters and their friends struggle with arithmetic. I was given opportunities to help children at school and it became obvious that I was able to simplify the processes and therefore the children did well. More and more children asked for my help. Where did the inspiration come from for the methods you devised? The inspiration for the methods that I devised came directly from the children whom I taught. In class, I would often use the material which had been given in the previous lesson as a starting point for my work, so that there was no division between the subjects. In other words, maths was not separated from other disciplines, but rather a beautiful addition. The children would often discover patterns within the work on the board. I would then take that observation home and play with it until a cohesive method became apparent. What is the essence of your teaching methodology? The essence of my teaching methodology is the fact that odd and even numbers are distinct and 'behave' differently. They have different qualities. The odds are active, yang, distinct and appear less frequently than the evens, which are passive, yin and the more common numbers. Working from this base, the four operations are simple to compute as the answers are obvious once we understand the workings of the odds and evens. By doing the numbers building, partners for 10 and mirror game until they are firm in the mind of the student, all future understandings come with ease. What advice would you give to a student who is struggling with maths? I try and let my students have confidence that they will make it, no matter how bleak the situation seems. With the older students, my aim is that they see that they can add up two 2-digit numbers in the first lesson, no matter how number phobic they are. I ask the students to give me an hour of their time, if they don't want to come back after that, no worries. I ask that they just watch - no thinking, no counting, no trying. I always praise every step. I make sure that I am not creating any confusion. It is so important that the first lesson creates a revolution in their attitude to maths. When the student sees that they can add up numbers that they never could before, and all this in one hour of tuition, they want to continue with me. It is important for teenagers to know that one has empathy - no judgement of their ineptitude with maths. It really depends on the age of the student as to how I approach the initial contact. Some children need a bit of time to talk about how they feel about it all. A maths teacher needs to be a person who loves numbers and wants to impart that love to the students. She needs to be patient, compassionate and have a sense of humour. She needs to be able to teach, this means that she can move mentally at the speed of light so that the student never feels inadequate if there is a lack of understanding. She needs to leave each lesson on a high. All students must have a feeling of achievement and joy. Can you give an example of a student you taught and helped. It is not easy to choose one student out of all the children who it has been my honour to teach. I think that the most remarkable are the ones who come here with a diagnosis that relegates them to the realm of slow or difficult students and who, after a few weeks have left that label behind. One young girl, aged 9 was brought here by her mother and was very unwilling to have anything to do with me. She was crying. I let her cry for a while and then told her that we would either have to ask her mother to pick her up, or we should get on with our lesson. She turned around and said that she would have a lesson. That girl was at the bottom of the class in maths, she had very low self esteem, had talked of killing herself on more than one occasion and was seeing a therapist. Within a few weeks she was learning at a rate that I found astounding, she was at the top of the class, excelling in English, no more therapist , achieving in sport and an all round delight of a child. I told her mother that she didn't need any more lessons, but the mother told me that the family needed her to continue having lessons with me. She is now pushing me to learn more and more Vedic maths to keep up with her insatiable appetite for mathematics.